This year, I spent a lot of time camping with my family and hopefully making memories that will last for my little ones. I've enjoyed my crochet time but have also spent a good amount of time helping family and friends through various things in life. I am thankful every day that I'm able to do what I love with crochet and at the same time, with your help, I'm able to stay home for my girls while they are so young. I'm blessed to be able to watch them learn and grow and I thank you for your help with that! 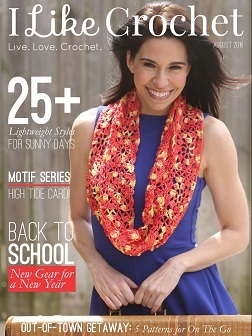 15 new crochet patterns have been added to my shop this year. Blankets have been my passion since I was 10 years old as you can see... Each one was fun to create as I had specific people in mind to give them to. I love the joy and comfort they bring to others and the thought that in some way, I'll always be there to comfort them if needed. 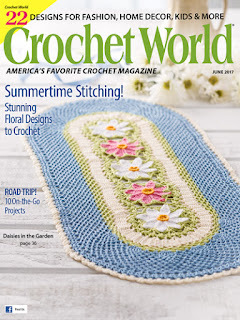 I was also THRILLED to have my first design published by Crochet World Magazine in June of this year! It was one of my biggest goals to be published and be able to give the issue to my grandma. Without her and my mom, I never would have made it this far! I am the only one who has carried on the gift of crochet in my grandma's family so it was a sweet and tearfilled moment when I gave her the actual Sea Breeze Throw and magazine for Christmas so she can enjoy this accomplishment too. Did she need another afghan? lol - no but this meant as much to her as receiving one of her handmade afghans meant to me. 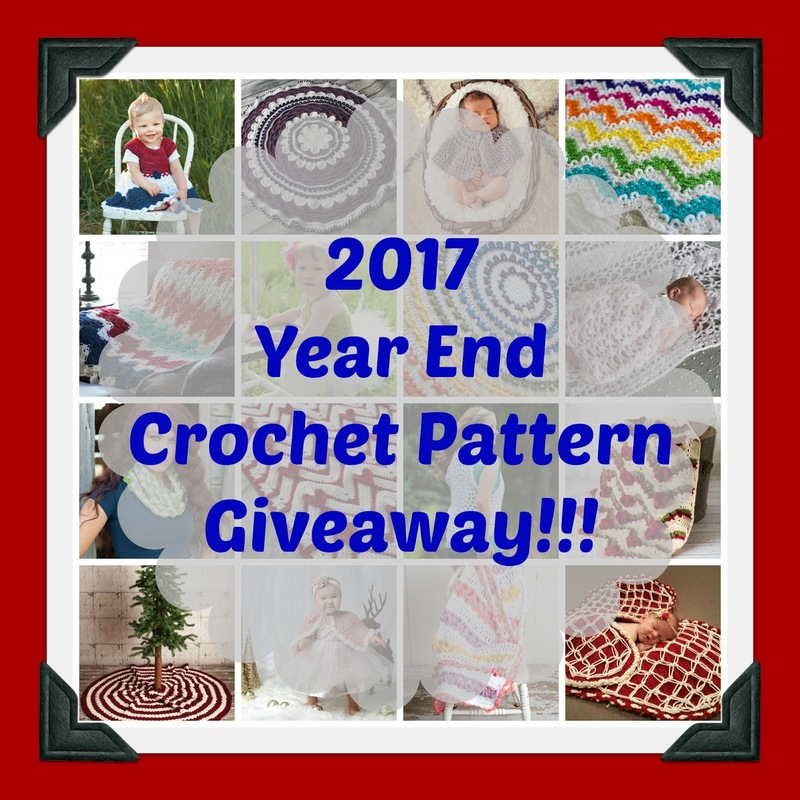 With all that has been done this year, I want to celebrate with you by offering ALL of my current patterns to 1 winner. All you need to do to enter is click on the Rafflecopter link and follow the options. Giveaway ends 12/31/17 and the winner will be announced on 1/1/18. Winner will have 48 hours to contact me by email: craftingfriends4you@yahoo.com to claim their prize or it will be forfeit and another winner will be chosen. I'm glad you love afghans! I'll try and release a few more simple designs this next year. Would love to see more pillow designs. Yay! I have some in the works. I am really loving the round afghans right now. I would love to see another one with lots of different stiches/texture. Your work is absolutely beautiful and I look forward to seeing what you create in 2018! I could go for a good wall hanging as well. I've thought about that a few times but haven't come up with anything I want to try yet. I've added it to my list though so maybe something will click this year. I love your designs. I personally would like to see some more of your pillows! Thanks Nicole. I have some in the works for release in February or March. You've got it! I should have a new scarf/cowl pattern released in early January. Kate you are amazing!! Your designs will be a delight for the winner! I am in love with your blankets! I am looking forward to seeing your designs for 2018! I would love to see a design using some of the self striping yarns. Thanks for the chance to win! I've added that to my list. We'll see what I can come up with! What a way to end 2017, and welcome 2018!! A nativity related tree skirt would be awesome! I love your patterns. My favorites are your blanket patterns. They are such unique designs. So I would say more blanket patterns. Thanks for the opportunity! Congratulations on your published afghan! It is beautiful that you wee able to gift it amd a copy of the magazine to your grandmother. I love that! I like small projects (deer totem- i get bored easily with anything larger than a lapghan! Lol) so i will say maybe sweaters and baby blankets? Thanks Heidi! I know a lot of people have a hard time with full sized afghans so most of my patterns include instructions to easily customize the size. I do plan on working some baby sized blankets though in the spring. Pillows and agree with the tree skirt idea. Love your patterns. I would like to see a doll or bunny. Thinking of Easter. Thanks for a chance to win. Can wait to see what the new year brings for everyone, my family has, babies, birthdays and big wishes!! I would like to see a shawl, or other wearables. Excited for whatever you design! Happy New Year! I can't wait to see what you come up with in 2018. Happy with whatever your imagination comes up with. Love all your patterns. I love Pillows so pillow designs are awesome. Or graph hats witha butterfly or butterflies on them. 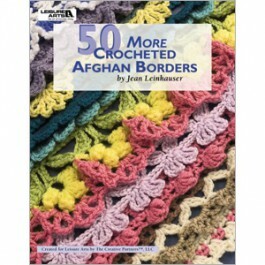 More Afghans, you can never have enough! I love all of your designs, so whatever you do in the future will be awesome, I’m sure! I would love to see some wearable items. Sweaters or hats. I enjoy blankets, hats, baby outfits, and baby blankets. It would be nice to find some things for teens to wear or make. Thanks for the chance to win. All of your patterns are absolutely beautiful! I would love to see a rug to match the braided cable block set!! Thanks for this opportunity! Whatever you do will be awesome !!! Love your afghans but would like to see scarves, cowls. Congratulations on being published. I think all of your designs are beautiful and it's a hard choice but I think I will go with afghans/blankets. I think they are customizable to the person you are making them for. The "right" pattern, with the "right" colors makes the afghan personalized and special. Rugs are also an interesting topic. This has been a fun year, and I've loved learning new stuff! Thank you for great patterns. Happy New Year!!!! Wow, so many good ideas in these comments! I'm still pretty new, so I'm excited to see just about anything. LOL Thanks for the chance to win your patterns! Would love to see more blankets and maybe an infinity scarf! I'm so excited, great way to start off the new year! Makes 2017 so much better. I live in the oven called Arizona LOL so something lightweight and is quick to complete. I like the sound of a wall hanging too. A Square afghan done in the round. Love your designs and looking forward to the ones you create in 2018!!! I would love to see more home decor designs. I have been blessed with three grandsons, how about more male patterns also. I love your patterns have many of them, I woulf love to win more! 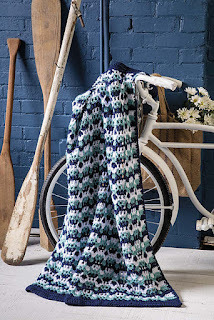 You have some beautiful patterns, adding to my crochet bucket list! So many beautiful patterns! I hope I win, because I can't choose just one! Thanks for the giveaway! Love your afghan patterns. They are different and lovely! Love you patterns! Thank you!!! I love the stitch designs you have in your patterns and I love making hats so maybe some hat or poncho patterns. Your gramma part of your post brought be to tears! How very proud of you she must be! All of your blankets are wonderful....I kind of have a passion for them too. Thanks for the opportunity to win the patterns! Happy New Year and all the best to you and yours in 2018 !!! More afghans, they are stunning! I love your designs, you are so talented and love talking and sharing with you. -35C with wind chill making it -40C to -50C and similar temps for a few more days... It's a good time to snuggle down and crochet. Love your patterns! Can't wait to see what the new year brings! I love the blanket that is on the bicycle in this article! I'm always looking for something new to crochet, looking forward to your new designs! I'd love to see flower/bird/butterfly patterns used to larger things like bed covers or afghans. Thanks! I love your designs! Thank you for the chance to win! Can I add my vote for afghans? Or something specifically for beds - nothing really "holey" but we are in Florida and don't need anything really bulky. Thank you for all you do! You are so talented to create all these designs, would love to win them. Love this give away! Ur so nice to do it and very talented. Thank you for the opportunity to win these beautiful patterns! I do not know which one I would make first!! I love how your patterns range from traditional to modern and fun--such talent! Thank you for the chance to win your patterns. I will enjoy seeing the patterns you create in 2018. Love your patterns! How about lake or nautical themed! I would love to see an adult sweater pattern! I love your blankets! This year though, I'd like smaller projects. Something with self striping yarns. I need a lap blanket for my mom while she is in rehab after a fall too. Afghans have always appealed to me. Am looking for one that would be enjoyed by my brother diagnosed with cancer this fall. A masculine design pattern with extra weight for warmth would be ideal. Thank you for your lovely work. Love all of your designs! Can't wait to see what you come up with next! Baby items such as garments, blankets, hats, and socks. Hooded scarves, ponchos with matching accessories. I love all your designs , I’m looking forward to seeing what you have for the New Year of 2018. I love your designs! Happy New Year! I would love to see you design a snowman tree skirt in blue, that would match my snowman tree. Thanks. This is super awesome!! Thanks so much!! I would like to see filet crochet afghans and bobble afghans...I'm an avid crocheter and love your site. Happy New Year! This is an awesome giveaway and you are awesome also and your patterns a beyond awesome! Thank you for this opportunity! 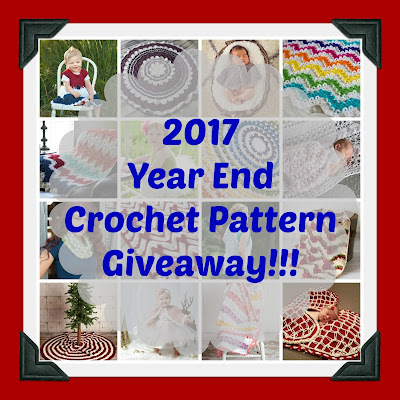 I am so excited to have a chance to win your patterns, they are awesome! I’d love to see more pillows as they are small and allow me to try out interesting stitch patterns quickly and easily. Thanks, for a great giveaway. I would like to use different stitches in small projects. ie pillows..as others have suggested or hats with mitts. This is such an awesome thing for you to do. Thank you so much. Hope you have an awesome 2018. I would love to see another dress pattern for little girls in 2018. I appreciate any pattern you design, I know I can't do it! lol I guess more blankets, I can always use more of those. Wow! Can't believe another year behind us! Looking forward to more crochet time in 2018! Would love to see more afghans and pillows! Can there ever be enough? Love your patterns. Would love a cardigan or vest for us plus size women. Clothes for women and older kids. I love your designs! I am looking forward to seeing what you have in store for us in 2018! Happy HOOKING!!! ~ Thank you!Can't wait to get started. Love all your work. Would like to see 1 skein projects. Wishing you a Happy New Year. Thank you for the amazing giveaway, Happy New Year! So many ideas already mentioned. How about baskets? Both Easter and storage. In line with a blanket idea, I'd love to see a carseat 'poncho'. Thank you for offering such a generous giveaway! Happy New Year!! I love your afghans, so I would like to see more of them. I have no specific design I'd like to see because I just love to crochet and I love your patterns!! Baby dresses or adult shirts in size 10 thread. I love almost all your designs! I would love to see baby dresses & sets. And maybe designs for 18 inch dolls (like American Girl dolls). I love making Afghans and baby stuff, but I also need some patterns that I can make and give for those 'hard to shop for'family members for birthdays & Christmas this coming New Year. Awesome giveaway. Thank you and Happy New Year!! I want a nice LONG stocking cap with a pom on the end that can hang between my shoulders! My dream hat. I love all your patterns, there easy to follow n awesome. I would love to see a Christmas-y shawl. Everything you make is beautiful! More blankets would be great. I would love to win you patterns as you have some gorgeous pieces of art. Baby Afghan, maybe a sweater and hat for baby to match it. Would love to see anything from you. Pillows would be great. I love all of your designs....hard to think of something new. Maybe more baby clothes? Something other than dresses. It's hard to find patterns for cute ones. I love rompers, overalls, jumper type dresses. 18" doll clothes are fun too. Whatever you come up with in 2018 will be awesome i'm sure!! Happy new year. I love your designs. Looking forward to seeing what comes next! Happy New Year! Such a generous giveaway, Thank you! Awesomesauce,Pam Stinnett is my name. Seeing as it's so cold right now and my feet are freezing, I'd love to see a pattern for fluffy, comfy slipper socks. I would like to see you do more snowpeople. I love all your designs. Anything Christmas, snowmen men and women, mr and mrs santa, reindeer, elves, christmas tree skirts. And something doily like to put on my fireplace mantle. Thank you and Happy New Year!!! I would like to see more amigurumi patterns. Thank you so very much for sharing your "gift" with all of us...My favorites, afghans and pillows!! Love them, love them! :) Happy New Year! Amigurumi patterns for larger dolls. Love them all I have a few on my to buy list. I love your patterns. tThey're all so beautiful. Happy New Year! Can't wait to see what you come out with in 2018. All your patterns are awesome !! I like a little bit of everything. I love your baby dresses! Hats are my favorite things to crochet, so I am always looking for new designs. I would love to see a crochet messenger bag, akin to a sturdy,canvas one I had in youth. I love crochet bags (handbags or market bags) and would love to have new patterns. Wishing you a joyous and creative New Year! I like bags and Afghans as well as amigurumi. I love bags and afghans. Hats too! Love to see some shawls! How about pillows or window treatments? Love everything you do!!!! I'm having a new niece this year so I would like baby patterns,pillows, and graph blankets. Thank you for what you & share with us. Your designs are great!